Jockey Jamie Kah says Midterm was getting stronger to the line, easily winning the Manion Cup. Jamie Kah’s disappointment about Harlem’s no-show at Rosehill has turned to delight after her Group Three win aboard Midterm. Kah, who recently moved to Melbourne from South Australia, claimed her first Group One win on the Lindsay Park-trained Harlem in the Australian Cup earlier this month. 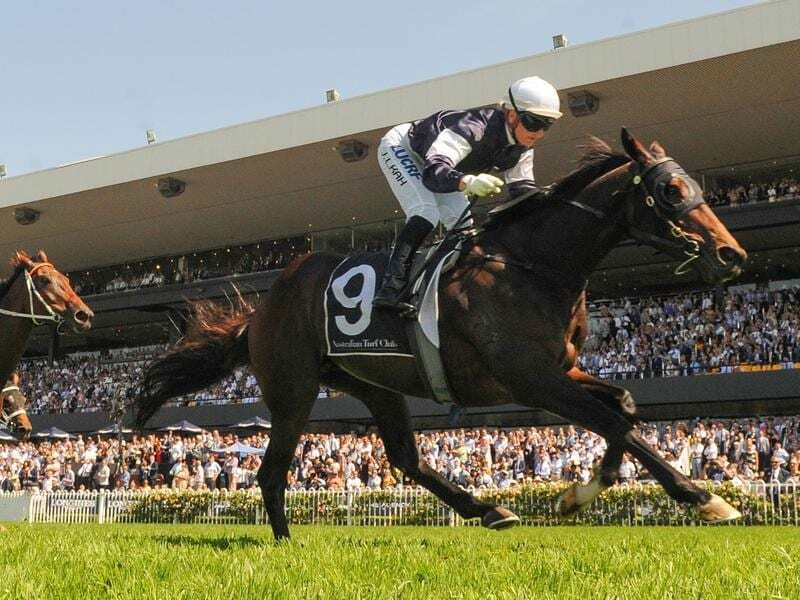 The stable elected not to bring him to Sydney for the Group One Ranvet Stakes (2000m) but Kah picked up the ride on the Lloyd Williams-owned import Midterm in the Group Three Manion Cup (2400m) on her first visit to Rosehill. “I’m so rapt,” Kah said. “Harlem was supposed to run here today, but unfortunately he didn’t accept, but I picked up the ride on this beautiful horse and the race couldn’t have gone better to plan in the end. What a tough little horse he is. “I had a good talk to Team Williams and they wanted this horse to run along at a decent clip. Once we got to the 1000 metres I wasn’t going to be waiting for them. I knew this horse was fit and could rattle off those times. Midterm ($5.50) was outside the leader Big Blue to the turn and assumed control in the straight to beat Big Duke ($8) by two lengths with favourite Shraaoh ($3.70) another length third. The six-year-old by Galileo out of multiple European Group One winner Midday, notched his first Australian win in the Manion and firmed from $15 to $8 second favourite behind Dubhe for the Sydney Cup. Williams’ son and part-owner of Midterm, Nick Williams, praised their private trainer Liam Howley who prepares the horses’ at the family’s Macedon Lodge in Victoria. “It’s a real credit to all the team up there at Macedon and Liam’s done a good job with this horse,:” he said. We’ve had him a while but he hasn’t had a lot of luck. “Jamie rode him beautifully and gave him every chance. She would have looked at home at Royal Ascot the way she rode that horse.